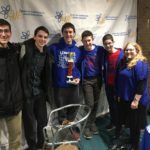 MTA took second place at the Center for Initiatives in Jewish Education (CIJE) Hack-A-Thon. The event, held on Wednesday, January 30th at Yeshiva University, presented teams of students from 13 different schools with the challenge of developing technology to assist the elderly at the Jewish Home at Rockleigh. Each team had just 4.5 hours to strategize and create a prototype. MTA team members created a distance-sensing wheelchair to help provide independence for an elderly, blind woman. The wheelchair uses ultrasonic sensors to detect its position and notifies the woman by increasing the rate of vibrations with a motor as it moves closer to an object. It also includes a button that allows her to directly contact her nurses via a website. Students also built the website and coded the ability for it to send messages from the wheelchair regardless of its location. MTA’s team members were excited to participate in this unique initiative and felt they learned a lot from the experience.